KILLING MOSQUITOES IS A CRITICAL STRATEGY IN MALARIA CONTROL PROGRAMS. How do people get infected with malaria? Certain types of mosquitoes carry the malaria parasite from person to person. If you want to stop malaria, one way to do it is to kill these mosquitoes carrying the parasite. To create the highest impact and save the most lives, national programs must know the types and locations of mosquitoes flying around in their country. That way, they can apply the right insecticide to the right mosquitoes at the right times. For example, some mosquitoes like to rest on walls after they have fed, making indoor residual spraying an appropriate strategy. Collecting information like this is not an easy task. It is expensive and requires a wealth of technical resources often not available to the developing countries most burdened by malaria. Akros has developed the very first national-led, decentralized entomological surveillance program in Zambia. Our technicians analyzed the chief entomological outcomes required by national malaria control programs, consolidated key, routine processes in an operational protocol deployed to environmental health technicians (EHT) in over thirty (30) districts in Zambia, installed a user-friendly data capture and transmission system (DHIS2) to speed the data from far-flung districts to a central database, and trained staff from the Ministry of Health on system maintenance, usage and data analysis. 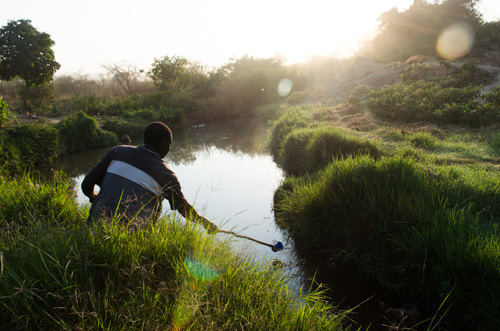 At Akros, innovation meets operations – even when it comes to killing mosquitoes and preventing malaria. The figure below illustrates the EHT Route through the integrated entomological surveillance program.